Homepage Uncategorised NeedleSmart are exhibiting at leading healthcare business platform, Arab Health, in Dubai. 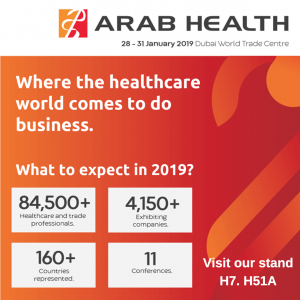 From 28th – 31st January 2019, NeedleSmart will be exhibiting at Arab Health, the largest healthcare event in the MENA (Middle East and North Africa) region. With more than 43 years as the leading healthcare business platform in the Middle East, Arab Health is a hub of knowledge and the perfect avenue for us to showcase NeedleSmart’s innovative products. NeedleSmart has developed unique, market-leading technology that heats hypodermic needles into a molten state prior to compressing it into a ball. The process takes just a fraction of a second to create a safe, sealed sphere of sterile metal that is no longer sharp. The products enable a safer working environment for healthcare professionals as well as a potential to create sustainable recycling. There is a direct cost saving as the NeedleSmart range has the potential to reduce hypodermic needles to sharps bins by up to 70% and generate a reduction in sharps disposal cost in the order of 30%. It costs just 1p to fully charge and 0.5p to melt 300 needles, (12.5p/kWhr). Held at the Dubai World Trade Centre, Arab Health 2019 will be represented by 160+ countries, 4,150+ exhibiting companies and 84,500+ healthcare and trade professionals, meaning it is the ideal place to meet new customers. It is also an opportunity to strengthen relationships with existing clients, increase brand exposure and ultimately generate new business. 2018 Arab Health saw Ministers of Health come from UAE, Saudi Arabia, Oman and more, therefore is set to be a fantastic networking environment. NeedleSmart will be exhibiting on stand H7.H15A. For further information about NeedleSmart and our products, please visit http://www.needlesmart.com or call 03301244360 to speak to Martin Burgess.